In a few short weeks time, I won’t be able to speak. I won’t be able to chew. I won’t even be able to swallow. So, today, we met my speech pathologist, Dr Compassionate. She spent more than one-and-a-half hours with us. She wanted to hear my story from the beginning. She was sympathetic, helpful and generous with her time. Exactly who you’d want to be there with you through the hard yards of recovery. When she’d call to set up the appointment, I’d explained quite how little information I had from Dr P on my speech pathology needs. She had since called Dr P and knew more, but still asked me to run her through what had happened to bring us to this point. You see, on the way to our appointment, I’d just called J at Dr P’s office to ask follow up questions about the hospital admission paperwork. She didn’t know when the pathology tests listed on the paperwork would take place, but the hospital will probably arrange all that. Probably? Perhaps on the night before surgery when I’d probably be admitted. Will I? You really DO need to know what to ask. I asked J on the spot if I could schedule a pre-op consultation with Dr P for all my questions. It could be difficult to find a time before 1 August, she demurred, but I could put my questions in an email for her to forward to Dr P. He is checking his email and is good at responding. Yes please. I’ll take whatever I can get. So Dr C’s mere hint of compassion brought on tears. I do need to ask questions and be comfortable, she agreed. If I couldn’t pin down my surgeon for a Q&A session, she directed me to people I could ask. The hospital or J at Dr P’s office, she suggested, should be able to put me in contact with the clinical nurse specialist or consultant who will be looking after me post-op. I can ask to meet her pre-op to ask questions. They should also be able to put me in contact with the dietitian who’ll look after me. I should raise with her my weight loss and milk allergy. And Dr C, of course, will help me as my speech pathologist. I’ll have what they call dysarthia, she explained, otherwise known as a motor speech impairment. While in many cases the cause is cognitive or neurological, my dysarthia will be a physical result of the surgery. In part, the cause is temporary. I may have intubation trauma from the tubes they insert to allow me to breathe during the 10 hour surgery and I may have residual hoarseness. Then there’s the nasogastric tube (NG tube) that will feed me, the tracheostomy that will enable me to breathe, and the wiring of my jaw that will help to protect my fibula flap while it heals. In part, the cause is permanent. The surgery removes the mandibular branch of my facial nerve and I’ll have sensory impairment of my chin and lip. This is the diagram she used as she led us carefully and thoroughly through what will happen. The nasogastric tube, Dr C said, will be inserted through my nose, behind my soft palate, down the back of my throat (pharynx), down my esophagus, into my stomach. This will affect my speech because you close the soft palate to shape some sounds. It can cause some discomfort, some ‘pharyngeal sensation’. It’s the tracheostomy tube that will be the real culprit. 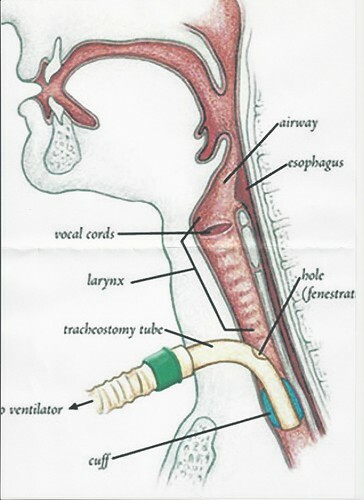 They insert it below my voice box (larynx) so I can breathe directly into my trachea without using my nose or mouth. Tracheostomy is a matter of ‘routine’ for my team because of the several facial swelling in this type of surgery. When you speak, air is pushed up from your lungs through the vocal folds in your larynx. This makes the sound and how you move your mouth shapes that sound. If my tracheostomy tube has a window (fenestration) in the top that allows some air to pass through, I may be able to make some sound. Otherwise, I won’t. Even once it’s removed, my voice may be weak and breathy. We will start working on my swallowing after they remove the tracheostomy tube. My notes from our consultation with Dr A suggest this is 24 to 48 hours after surgery. I’ll start on liquid puree, exactly as Alannah first did all those months ago. As I eat more, my dietitian – in consultation with Dr C – will dial down amount I’m fed through the nasogastric tube. And as with Alannah, they’ll increase the consistency of the puree as I can get more down. I’ll be able to move on to very soft foods probably about six weeks after surgery when they remove the wiring from my jaw. Steak and apples are a very distant prospect. Once I can swallow well, we’ll work on speaking. I will learn, slowly, to compensate for the sensory impairment from the loss of the nerve. I’ll see her in hospital and later as an outpatient, perhaps weekly in late September and October. We’ll do jaw, lip and tongue exercises. In the meantime, of course, I’ll need to communicate. Most simply about my pain levels or needs while in ICU, but about other matters as well. While I’ll want the good old pen and paper, she said, the iPhone has some great apps that have revolutionised her practice. She pointed us particularly to two Lingraphica apps: ICU and small talk. Perfect. And free. Before we left, Dr C did some video and sound recordings to use as a baseline for my speech recovery. I read the Grandfather Passage, a common reading used for speech evaluation. She gave me a picture and asked me to describe what I saw. I completed a variety of tests against a dysarthia profile checklist. The tests cover respiration, phonation, facial musculature, diadochokinesis (repetition), reflexes, articulation, intelligibility, and prosody (rate). I’m so very glad Dr C will be on my team. You wished to know all about my grandfather.Well, he is nearly ninety-three years old. He dresses himself in an ancient black frock coat, usually minus several buttons; yet he still thinks as swiftly as ever. A long, flowing beard clings to his chin, giving those who observe him a pronounced feeling of the utmost respect. When he speaks his voice is just a bit cracked and quivers a trifle. Twice each day he plays skillfully and with zest upon our small organ. Except in the winter when the ooze or snow or ice prevents, he slowly takes a short walk in the open air each day.We have often urged him to walk more and smoke less, but he always answers, “Banana Oil!” Grandfather likes to be modern in his language.